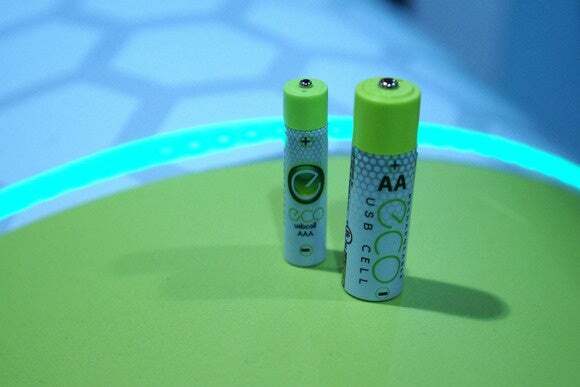 The Eco USBcell features a power control chip to match the voltage to the standard disposable alkalines we’re used to. Lithium batteries beat nickel metal batteries in recharge time and the number of times they can be recharged. And when compared to disposable alkaline batteries they have an even bigger advantage. Alkaline batteries also have a nasty habit of starting at 1.5 volts, but then quickly declining as the energy is drained. Alkaline batteries in a toy mechanical rabbit, for example, would start beating its drum quickly initially and then gradually slow down until it was moving comically slow. With the flat discharge curve of the USBcell, the same toy should behave the same from beginning until the battery is fully discharged. 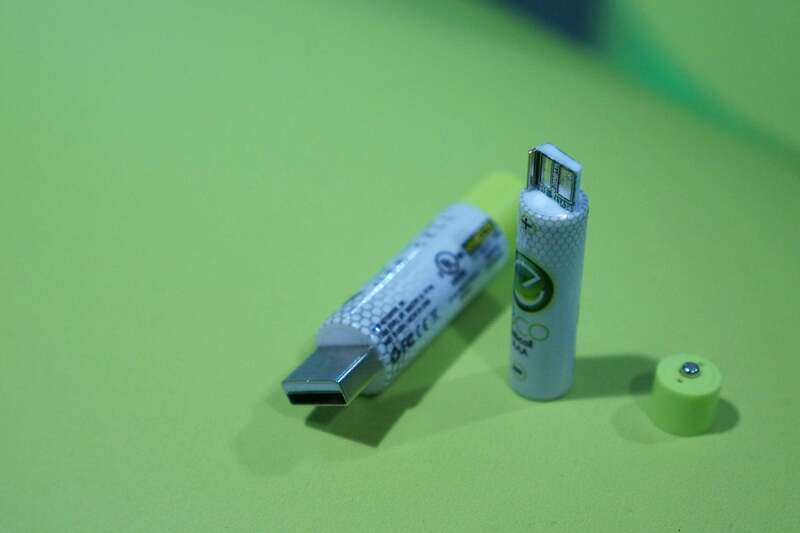 The Eco USBcell batteries are based on the same lithium polymer technology used in smartphones and can be recharged by plugging them into your USB port. And that’s not even the slick part of the USBcell. Once the battery is dead, you simply pull the top off to reveal a standard USB Type A port. That means there’s no need to carry a charger anymore. Plug it into a 1 amp wall-wart charger and it’ll be topped off in about two hours, even flashing an embedded green LED to let you know. The company says it can technically be charged on a computer’s USB port, but it’ll be a lot slower. Even slicker, you can attach the removable cap to the back of the battery while it’s charging, so you’re less likely to lose it. But how can you fit a USB Type A onto a tiny AAA battery? You can’t fit a full-size one, true, but since you only need positive and negative to charge it up, the AAA Eco USBcell has half a USB Type A plug, which still lets you charge it in a standard USB Type A port. The batteries can be recharged about 500 times before the capacity begins to diminish significantly, but in that time the company says you will have saved a lot of landfill. The list price of a pack of four is $20.